Devised, designed and produced in Italy. In 100% removable organic cotton. Available in 4 colours. The feet are in solid oak wood coated with water-based varnish. Wooden front side in Finnish birch plywood. The front side can only be removed in the sofa version. 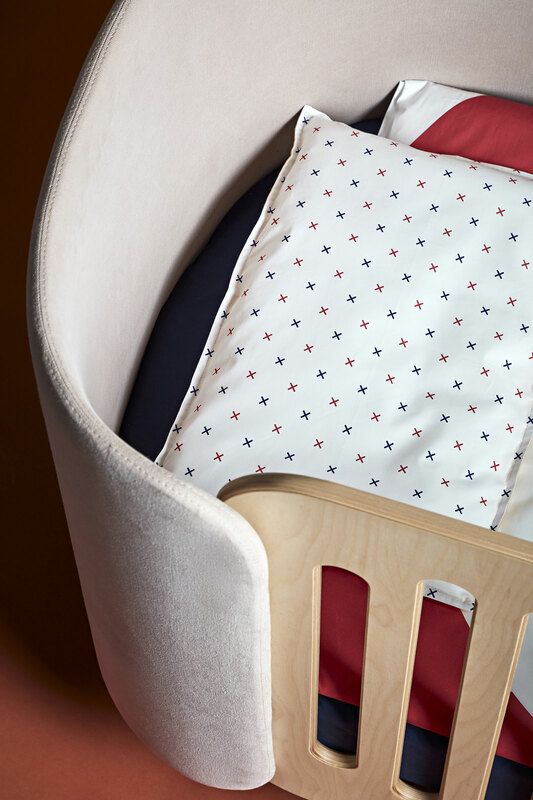 The mattress base has an adjustable height to effortlessly pick your baby up and lie it down again. It’s made from perforated poplar plywood to ensure proper ventilation. Made of 100% natural cotton fibres that are gentle on baby’s skin..
3 dual-colour versions: the left-hand side can be chosen in plain green, pink or light blue fabric while the right-hand side will be white and quilted. 4 single-coloured versions: the left-hand side is available in plain fabric while the right-hand side will be quilted in the same colour.. The mattress base has an adjustable height to effortlessly pick your baby up and lie it down again. 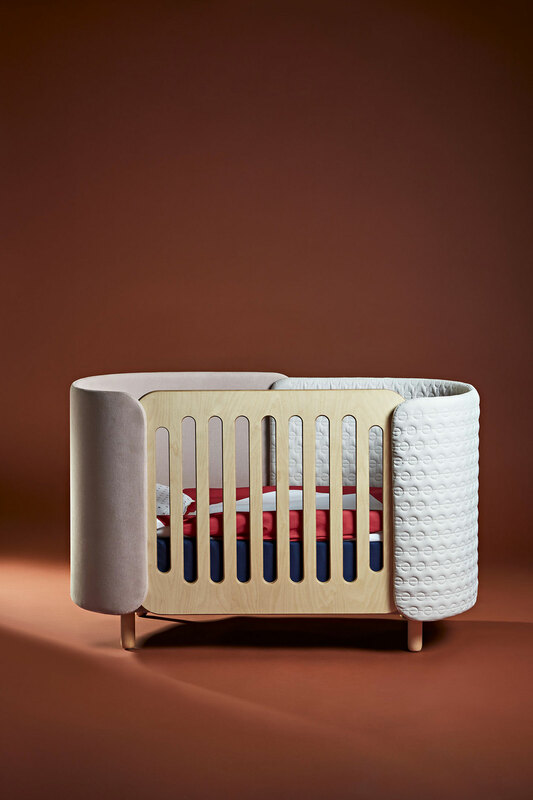 It’s made from perforated poplar plywood to ensure proper ventilation..
Made of 100% natural cotton fibres that are gentle on baby’s skin. provided with a polypropylene safety system to guard against accidental detachment. The front side can only be removed in the sofa version. The padded sides are made of curved poplar plywood covered with 8mm thick, 3-layer bonded velveteen made of 100% polyester. The frame is in sturdy and resistant poplar plywood. The feet are in solid oak wood coated with water-based varnish and have a threaded pin used to screw them onto the bed frame. The removable covers are in 100% organic fabric which can be washed at 30°C (it is unadvisable to use a dryer). 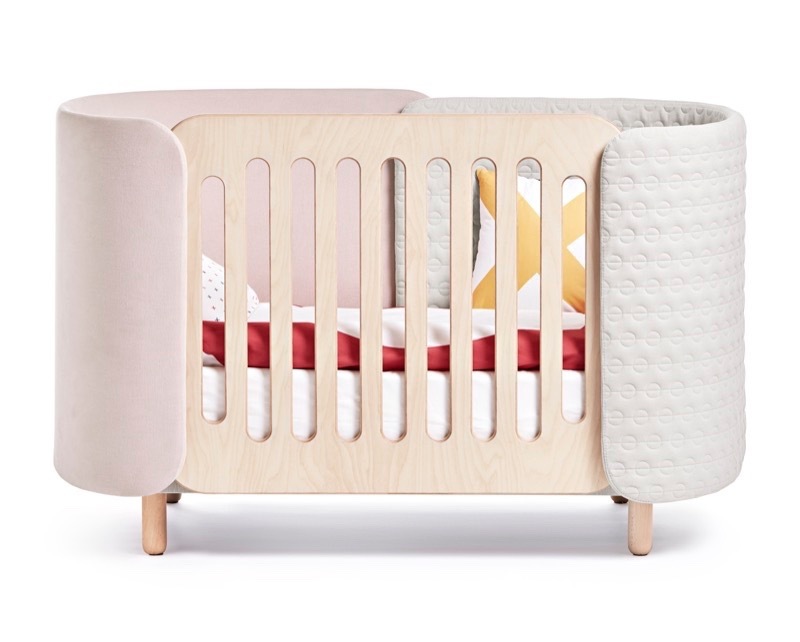 The base (covered with fabric) and the mattress base (in the crib version) are made from perforated poplar plywood. The moulded mattress is 120mm high in D21S polyurethane and is covered entirely with removable hypoallergenic and antibacterial DRILLCOT fabric (washable in water at 60°C).